Being competitive requires a long-term commitment to the process of continual improvement. In eastern cultures, this process is referred to as Kaizen — or “change for the better”. To improve a specific process or result, it’s imperative to know where you are starting from. Using Google Analytics goals and conversion tracking allows you to understand where you are today and track how any changes you make affect your future results. Making smarter decisions about content messaging, advertising spend or products or service becomes possible with analytics. You will no longer need to rely on hunches or feelings. Instead, you’ll be able to make business decisions based upon real numbers and hard data. You’ll be able to act upon what you know, instead of what you think or feel. One of the ways to track your analytics and conversions is by using the free version of Google Analytics. Let’s take a brief look at two different aspects of GA: how to track of important user events on your website and the basics of tracking goals and conversions. Relying on vanity metrics is a mistake that many people make and one that you want to avoid. It’s more important to understand what visitors are doing on your website than it is to know your gross traffic figures. Your website was built with a purpose in mind. Attracting new leads, selling products or signing people up for services are examples of things you might want to accomplish. Those are events that have an impact on your business. Those are the types of events you want to measure and improve. Clicking on an external link. Clicking on a “proceed to checkout” button. How often are social sharing buttons clicked? How many times a file clicked to download. How much of an enrollment form a student fills out before abandoning the process. 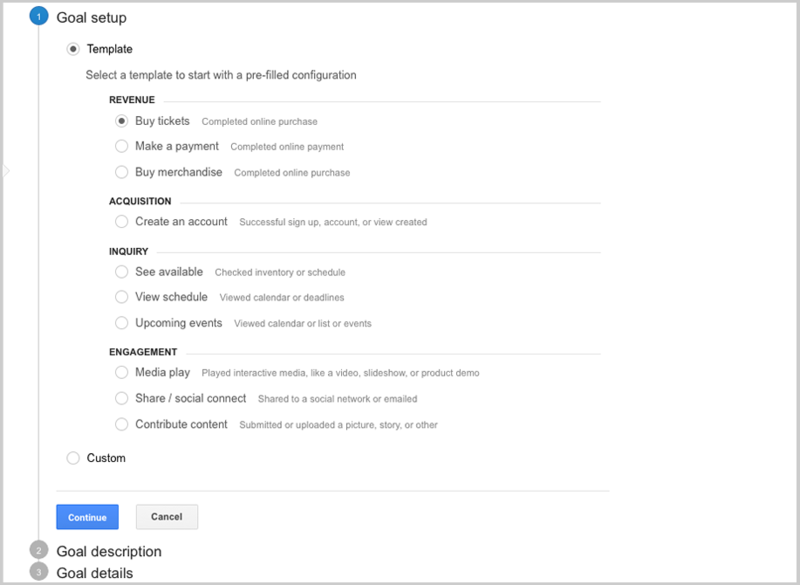 Google analytics allows you to track up to four different elements for each event including category, action, label and value. Only the first two are mandatory however the more organized and compartmentalized your data is, the easier it will be to analyze. As a simple example, we might use event tracking to determine which color button is more likely to be clicked by a user. We could also determine whether a visitor from a specific source is more likely to click a specific button. Pushing these events into Google Analytics simply requires inserting a GA snippet into your appropriate button code. The list of potentially trackable events is unlimited. The trick is to decide which events are important to the overall objective of your website. That’s where you should focus your time and energy. It’s important to understand which goals are most important to the success of your business. A goal or conversion signifies the completion of the desired action. Using an eCommerce store as an example, a conversion would be represented by the completion of a purchase. In most situations, this would mean that the visitor is taken to a “thank-you” page or a “purchase completed” page. Similar examples for a college or university would be an enrollment confirmed page. For a service based business, it could be filling out an inquiry form and being redirected to a page that says “we’ll be in touch”. Once you understand the action(s) you want visitors to take, you can start measuring the effectiveness of your website and optimizing for improved results. Destination goals – did a visitor complete a specific action and land on a destination page? Duration goals – how long a visitor was engaged on your site? Pages/Screens per session – how many pages did a visitor view? Events – did the visitor take a specific action (see recording events above)? When setting up goals, GA provides easy to use templates based upon the type of goal you want to create. For example is your goal revenue, acquisition, inquiry or engagement based. Each template can be customized and tweaked as required. Conversion tracking involves understanding what steps a visitor takes from the time they land on your website until the time they either complete your objective (ie. make a purchase, sign-up for a service etc) or leave your site. Of course, it also important to track what happens before a visitor lands on your site and we covered that in our last post earlier this week on tagging traffic from your lead sources using Google’s standard UTM parameters. Remarketing allows you to show follow-up ads to anyone who has previously visited your website and failed to convert. Some platforms like Facebook utilize their own tracking pixels or you may choose to use a remarketing platform like AdRoll or Perfect Audience. If you’re not already using Google Tag Manager as an easy way of consolidating your individual snippets into one place, you don’t know what you’re missing. GTM will also allow you to assign a firing or blocking trigger to the appropriate pages of your website which will, in turn, push the applicable data into Google Analytics. Google Analytics is rarely an out-of-the-box solution. In its native form, extracting actionable information can be a challenge. By tracking specific events and goals, you will be in a position to make business decisions based upon real numbers and to improve your results over time. The most important thing to remember is that even if you’re not ready to begin analyzing data today, you should start collecting it. That way, it will be there when it’s needed. Ready for the next step? Read our guide on how to use Google Analytics in WordPress, and then learn how to build effective Google Analytics dashboards. If you have any favorite data tracking tools you like to use with WordPress, please share in the comments below. Do you have any specific events or goals that track and analyze meticulously?